Connor asks Michelle if staying in Erinsborough is so bad. Dee's surprised Toadie would think something's going on, but he points out it's inevitable and he's been trying to find out. Eventually she admits that something happened at work and she's been too scared to tell him. Connor and Jack are very comfortably ensconced in Joe's 'shed', discussing Shakira and the likelihood of Nina becoming a star. Joe comes to join them and points out the value to a 'bloke' of a shed, where he can escape the three 'w's-work, women and 'whatnots'. He gives Jack a meaningful look but Jack obviously doesn't want to talk about 'whatnots'. Joe mentions it takes someone special to want to give it a go in the big time. Lyn arrives and isn't too pleased she has to come and tell them tea's ready. Nina's on the phone to her mother and tells Michelle the problem is her parents are the pushy sort who have always entered her in beauty pageants, fashion shows and talent competitions. Since she won the song competition they're pushing her to Hollywood. She has just told Michelle she wants 'normal' parents like hers when Lyn comes in yelling 'I swear Michelle, if your father doesn't quit this bizarre obsession with the garage, I'm gonna move him down there permanently. I mean you'd think coming inside for dinner wouldn't be that big an ask!'. Michelle and Nina exchange 'looks' and Michelle says Nina needs to remember everyone's folks are 'as nutty as each other's'. Dee says she didn't tell Toadie because she was afraid he'd be too angry, as he was when Ray made a move. She hasn't done anything official as she wasn't sure anyone would believe her because she's just a nurse up against someone of Martin Cook's reputation. She even wonders if she somehow invited it. Toadie trusts her not to have given Cookie 'signals' and says he knows more than physical means of dealing with it-Cookie's broken the law. When she gets very upset, saying she wants to forget about it, he hugs her and says that's what they'll do. Lyn is snuggling up to Joe while he watches football on TV. She wants to get affectionate but he hardly notices, just gives Jack and Connor an update on the match as they walk in. 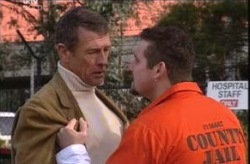 Toadie confronts Cookie in the carpark, saying how disgusting it is to use his position to take advantage of young women. Cookie denies everything and patronises him, saying he's not responsible for every young nurse's 'crush' but he's sure Toadie and Dee will sort it out. Toadie says they will bring him down, but he scoffs at the idea, saying he's been seeing too many B-grade movies. Nina tells Michelle, Connor and Jack that her parents even want her to leave school. Jack thinks she shouldn't rush into it, that an education is important and gets sensitive and rushes off when Connor draws a parallel between his move to football and Nina's singing. Michelle comments that something is obviously up. When Toadie gets in, Dee realises where he's been and wishes he hadn't, because it will make things worse. They talk about it and after he says someone before her didn't deal with it and suggests this might have been lack of courage, she eventually agrees to 'go get him'. Lyn's all dressed and warming up to go jogging with Joe. He's not impressed-- 'I jog alone', but she answers that he's been doing lots of things alone and if them being together means jogging with him, she'll go. Just then there's a knock on the door-a girl who introduces herself as Lori, Jack's girlfriend. They're impressed she's looking so good after a long flight, but she points out it wasn't very long. 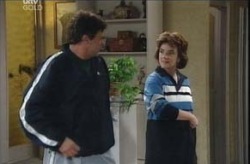 Lyn's very shaken by 'Laura's' appearance and feels her heart rate's up enough already, so a jog not necessary after all. She's not impressed when Joe comments that Jack has 'pulled himself quite a looker'. Toadie and Dee are at the hospital where Dee's very nervous, but he keeps saying how proud he is of her and they're going to go through with it. Cookie sees them and asks if it's a social visit. Toadie replies that they have an appointment. Following Joe and Lyn's directions, Lori arrives in the coffee shop where she asks Michelle and Connor where Jack went. Since they think Jack went home, she decides to buy a cake and is warned not to get the coconut one because Lyn hates coconut. She just replies that Jack loves it. Dee keeps her appointment and is asked to talk about the first time Mr Cook made advances towards her. Afterwards, she tells Toadie the interview was fine and she has been told she has grounds for complaint. She was given the choice between a formal complaint and an informal one, which would be dealt with in-house and has chosen 'formal' to bring it out into the open. Toadie will be her representative, but one problem is that a condition of this particular process is she must not talk to anyone about it, so she can't get the backing of any of the others. Jack goes back to the Coffee Shop and talks briefly to Nina about the parallel between her singing and his football. He's just started telling her he's not as (?couldn't make out what he was saying?) about it as he looks, when Michelle and Connor, (who have been 'chatting' at the counter about Lori being very attractive) tell him Lori's been and gone, probably home. He races off again. Meanwhile at the Scullys', Lyn's cleaning the coconut off her bit of cake, while Lori chats away. She puts her foot in it at first by describing Lyn's previous 'funny frizzy perm', but mentions too she knows a lot about them because Jack's so proud of them that he always talks about them. Lyn's a bit prickly so Joe's trying to smooth things over and emphasising her name LORI as Lyn keeps calling her Laura. Eventually, Lori tells them she thinks they're fantastic for taking the news so well as Jack was terrified to tell them. After some roundabout discussion she realises they have no idea what she's talking about. Toadie and Dee are eating at the pub. He tells her he's very proud of her but she's not looking forward to it. He's confident they will win, but offers to go somewhere else when Cookie arrives, but she says no, she's not going. Lori has told Lyn and Joe and says Jack must have had a good reason for not telling them, like worrying that they'd react like this, as Lyn's so upset. Jack bursts in saying he hopes she hasn't said anything yet. Joe says it's a bit late for that and they should sit down and have a little chat.